As part of filming in Toronto, Star Trek: Discovery has leveraged the talents of many amazing Canadian film industry creative professionals. 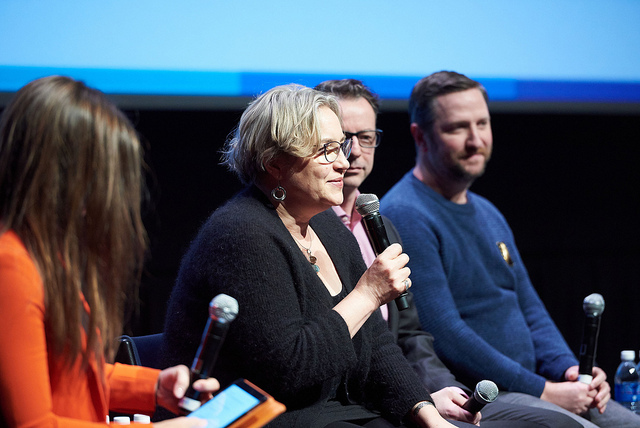 Last weekend we got a chance to hear directly from a group of them about what it’s like to work as part of Discovery‘s creative team, at an event called “Designing the Final Frontier,” hosted by the Ontario chapter of the Directors Guild of Canada. The theatre was packed as the lights dimmed for a screening of the Season 1 finale, “Will You Take My Hand?” On the big screen the episode looked and sounded stunning. It was really easy to appreciate all the little details, from the luminescent tattoos in the Orion tattoo parlour to the dramatic map of the Klingon homeworld. Even cooler was the panel after and getting to learn more about which DGC members did what to make the episode look and feel as good as it did. The panel moderator was Jody Clement, Star Trek Discovery‘s Art Director. Clement has a long list of credits, including three seasons of art direction on one of my sci-fi faves, Orphan Black. The panelists included Production Designer Tamara Deverell; Supervising Art Director Joshu De Cartier; Set Designers Matt Morgan, Emilie Poulin and Michael Stanek; Graphic Designer Andy Tsang; Set Designer and Concept Illustrator Chris Penna; and Motion Graphic Designer Timothy Peel (the one responsible for those Qo’noS maps as well as pretty much everything you see on a computer monitor on the show). The panel started with a virtual walk-through of the DSC set, including the bridge, which was 2-3 times larger than any other Star Trek bridge, apparently a shooting requirement set by Bryan Fuller. The original was also two storeys tall. Matt Morgan said the bridge took at many months of drawing and construction to create, with Morgan and Du Cartier working on more than 160 drawings over nine months. The bridge has 120 display screens, run by 84 computers, so that’s a lot of work for Peele and his team. In case you were wondering, I asked and this included writing Tilly’s to-do lists seen in S2E2, “New Eden,” which were inspired by one of the women in the department’s actual to-do lists. Next up the panel talked about everything we saw at the Orion black market on Qo’noS. The idea to go to the black market came about because, Deverell says, the writers wanted to do something not seen before on the Klingon homeworld, and the art department knew a black market would be fun. Many sets were repurposed from other episodes, with the Terran throne room turned into the Orion cabaret, and Terran crew quarters renovated to become the Shrine of Molor. 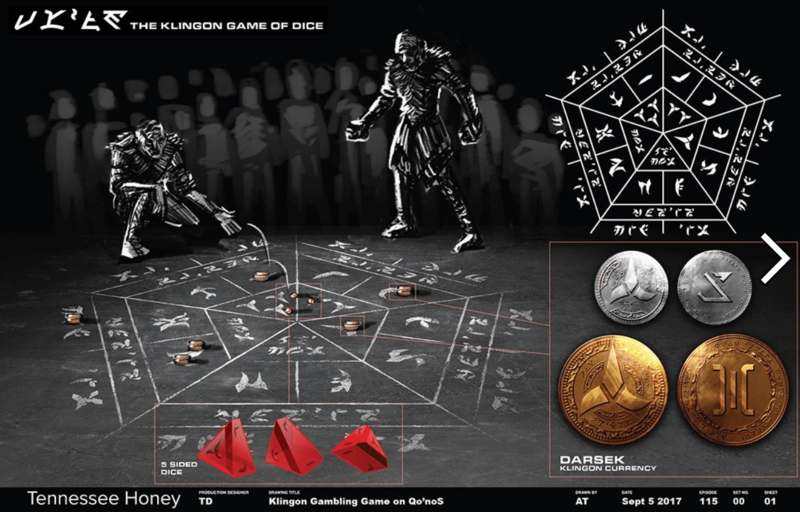 The Klingon dice game t’Sang was designed by, and named after, Graphic Designer Andy Tsang. Tsang not only gave the game a look and feel but also playing pieces and rules that the team taught the actors and director, to add a sense of realism. As for the tattoo designs? Everyone on stage had a hand in that, with Tsang and Penna leading the monumental task of drawing hundreds of tattoos. 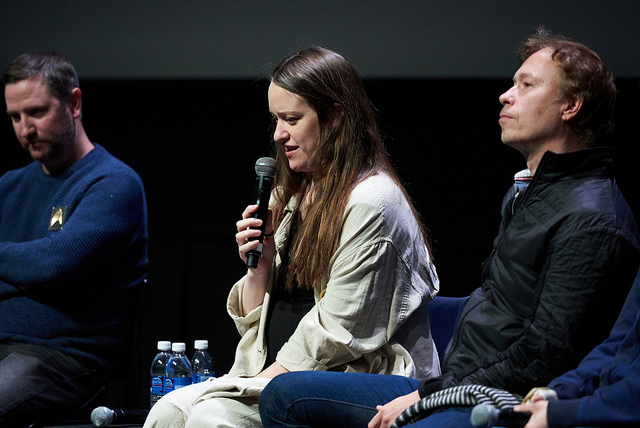 Set designer Emilie Poulin talked about designing the Shrine of Molor set, though the final filmed product was so dark it was hard to make out the incredible level of detail, including many ingeniously salvaged pieces from the sarcophagus ship. But Poulin’s favourite project for Discovery so far has been designing the huts in Saru’s village on Kaminar, seen in the Short Treks episode “The Brightest Star.” The village was filmed at Scarborough Bluffs (in Toronto) and though the team was originally directed to build something like Musgum mud huts, they decided they could be much more creative than that. By way of background, Deverell said they had long discussions about why they would not show disability as something that needs to be “cured,” which was an important point. For more on the “cure” narrative and why it’s so problematic, check out our podcast episode on disability and ableism in Star Trek. It would be easier to accept the reasoning for a lack of a lead character with a disability if they had found occasions to increase the profile of Alevizos’ character. At this point he hasn’t even had on-screen credit for his role, nor a name. But Deverell said we will be seeing other wheelchairs later this season (Pike maybe? There is a good opportunity to re-do that story right), and noted that the wheelchairs they design are both futuristic and functional because the prosthetics designer actually was a wheelchair designer himself. 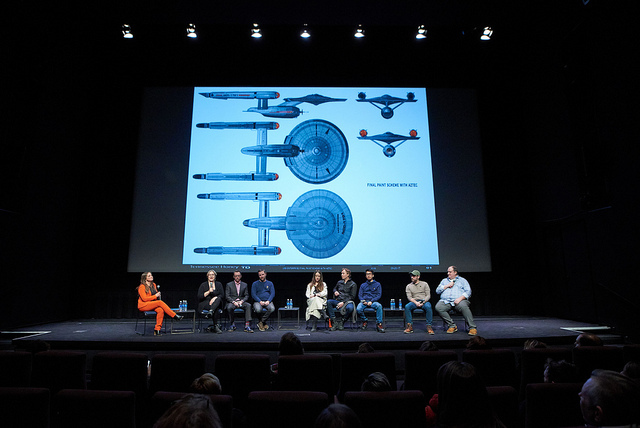 Every member of the Discovery creative team brings something different to the table, including different background knowledge of Trek. Peele self-identified as the biggest Trek fan, who’d seen all the non-animated episodes and couldn’t believe it when they got to work with Jonathan Frakes. Deverell grew up on TOS and most of the rest on TNG. 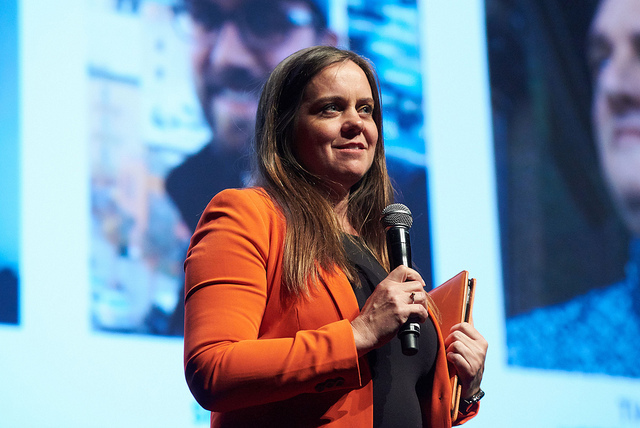 Poulin hadn’t seen any before she got hired on Disco, and said she had to do a lot of research, but appreciated the creative freedom that came with not having predetermined opinions. “There is definitely a weight to designing for this franchise,” said Matt Morgan. 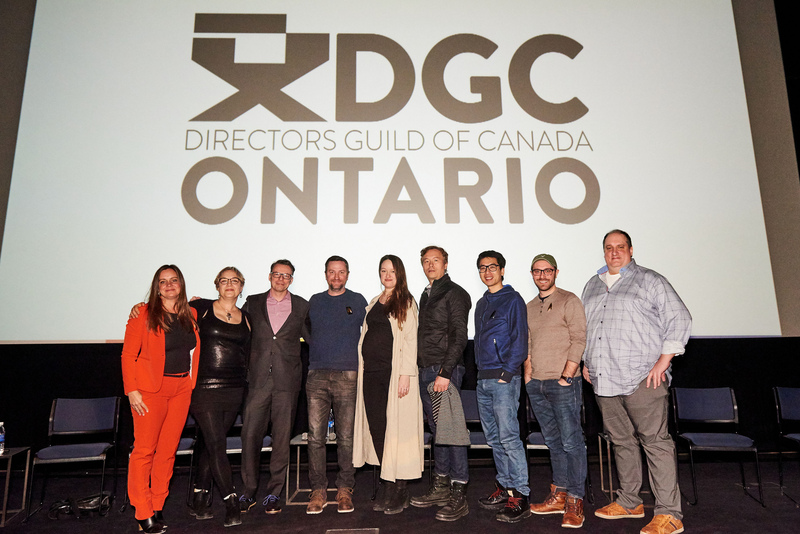 Big thanks to the Ontario division of the Directors Guild of Canada for putting on such a great event, and giving us permission to use the above event photos.